Store in a cool and dry place, keep in airtight container and use within 1 week after opening. Ingredients: Peach, Sugar, Salt, Acid (E330), Sweetener (E952, E955), Preservatives (E202, E211), Colour (E105, E120). 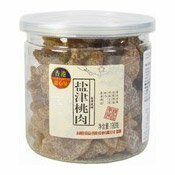 Simply enter your details below and we will send you an e-mail when “Dried Savoury Peach (甜心屋鹽冿桃肉)” is back in stock!